Before dealing with the actual changes to the Holy Week liturgy in 1955 under Pius XII, which were many and significant, we will take a look at the guiding principles of the 1948 Commission for the General Reform of the Liturgy and the manner in which its Secretary, Fr. Annibale Bugnini, went about his task of overhauling the Church’s most ancient and venerable ceremonies. Bugnini’s penchant for secrecy informed all his actions. We have seen how he had been making clandestine visits to the Centre de Pastorale Liturgique (1) since 1946, the year in which Pius XII requested Card. 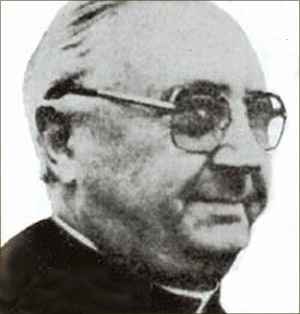 Carlo Salotti, the Prefect of the Congregation of Rites, to begin forming a project for the general reform of the liturgy. Bugnini himself admitted that his Commission met “in absolute secrecy.” He transmitted selective information via Fr. Augustin Bea and Msgr. Giovanni Battista Montini “up the back stairs,” so to speak, to the Pope, kept the Sacred Congregation of Rites in the dark and sprang the first of the Holy Week reforms on the unsuspecting faithful in 1951. This raises the question of collusion with Bugnini, and whether the Easter Vigil reform had been, as it were, stitched up between them. These words of inflated self-esteem – “I am the liturgical reform” – were attributed to Bugnini by a close colleague. (4) Whether or not Bugnini actually said them, he had no difficulty in fulfilling the absolutist role. It is also an example of the corrupting power handed to him by Pius XII. Without such papal backing, the work of the Commission would have ground to a halt. But with the power of the Pope behind it, Bugnini’s Commission became an end in itself, unchallengeable and unquestionable, the ultimate bureaucratic weapon against all objectors. It would grow into a global, powerful and unaccountable industry forcing the world’s Bishops, willy-nilly, to toe the Bugnini line. It is not generally appreciated just how controversial the 1951-1955 Holy Week reforms were in their day. Historical records exist to show that they were vehemently criticized by many Bishops, priests and lay people on account of the radical nature of the changes then initiated. Among the most outspoken critics was Msgr. Léon Gromier, a distinguished Prelate of the Papal Household and a Canon of St. Peter’s Basilica. As a consulter to the Congregation of Rites since the time of Pope Pius X, he was in a position to speak with authority on the Holy Week ceremonies. His knowledge was legendary on all liturgical subjects from bugia to buskins and falbalas to faldstools, which made him the strongest of advocates for arguing the case for the traditional rites. Msgr. Gromier, who had been publicly criticizing the Liturgical Movement since 1936, gave a conference in Paris in 1960. (5) (See here) In it he excoriated the 1955 Holy Week reforms, exposing the false liturgical science and the false reasoning behind them. Pius XII used legislation to introduce arbitrary and unnecessary changes devised by revolutionaries. This put the law-abiding Bishops (who placed obedience to the Pope as their foremost duty) into an untenable position: They were thus maneuvered into implementing the reforms that they objected to on grounds of the Faith. In other words, giving them no choice but to comply forced them to act against their principles and their conscience. And because Maxima Redemptionis legitimated the actions of progressivist clergy who had been implementing the reforms without the Pope’s authority for decades, it was a document fundamentally biased against the traditional rites. This reveals a quite considerable degree of contempt not only for traditionally-minded Bishops but also for those Catholics who were attached to their traditions and had never requested or welcomed such changes. Whether such a document against all the past of the Church had the power to bind the faithful is a question open to discussion. 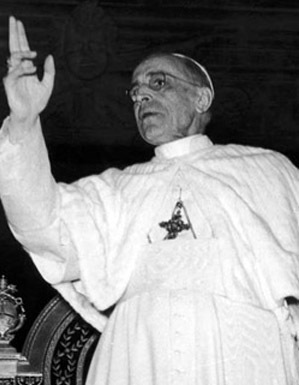 In short, the 1955 Holy Week reform, whatever the degree of Pius XII’s complicity in it, was a papally-backed mechanism for re-ordering the liturgy to incorporate the basic wishes of the progressivists and to begin implementing their ideas for future changes. That is how the will of Bugnini’s Commission triumphed – and thus inescapably stifled opposition. The CPL was a liturgical think tank characterized by ideological commitment to the most avant garde reforms. Annibale Bugnini, La Riforma Liturgica: 1948–1975, Liturgical Press, 1990, p. 25. The reason for his astonishing candor was that he regarded his scheming not as something to be ashamed of, but to boast about. “De solemni vigilia paschali instauranda,” Acta Apostolicae Sedis, February 9, 1951, pp. 129. Bugnini was mistaken when he said that the publication date was the beginning of March 1951. Anscar Chapungco OSB, What, Then, Is Liturgy? Musings and Memoir, Collegeville, MN: Liturgical Press, 2010, p. 4. Fr. Chapungco, former President of the Pontifical Liturgical Institute in Rome and avid defender of the reforms, recalled that Bugnini spoke these words during one of his visits to the Institute. L. Gromier, ‘La Semaine Sainte Restaurée’, in Opus Dei, 1962, n. 2, pp. 76-90. Opus Dei was a monthly journal edited by a French priest, Fr. Ferdinand Portier, who was known for his arrangement and promotion of Gregorian Chant. These included Msgr. Felice Bonomini, Bishop of Como, Card. Giuseppe Siri, Archbishop of Genoa, and Msgr. Cornelio Cuccarollo, Archbishop of Otranto. Apud Alcuin Reid, The Organic Development of the Liturgy, Ignatius Press, 2005, p. 222, note 270. Alcuin Reid, ibid., p. 231. See, for example, The Catholic Herald and The Tablet. Writing in The Spectator in 1962, Waugh stated: “During the last few years we have experienced the triumph of the ‘liturgists’ in the new arrangement of the services for the end of Holy Week and for Easter. For centuries these had been enriched by devotions that were dear to the laity – the anticipation of the morning office of Tenebrae, the vigil at the Altar of Repose, the Mass of the Presanctified. It was not how the Christians of the second century observed the season. It was the organic growth of the needs of the people,” apud Scott Reid, A Bitter Trial: Evelyn Waugh and John Carmel Cardinal Heenan on the liturgical changes, London: St Austin Press, 1996, pp. 24-25. Sacred Congregation of Rites, General Decree and Instruction, Maxima Redemptionis, November 16, 1955, Acta Apostolicae Sedis, vol. 47, p. 840. This claim was made by the Prefect of the Congregation of Rites, Cardinal Gaetano Cicognani.